The Dubois County Sportsmen's Club was found around the year 1975. It was originally founded by local farmers and land owners in an effort to combat the local poaching issues. Our club started a local version of the TIP program that the State of Indiana adpoted. We have since added the education of youth to our mission and have become a 501(c)3 charity. We donate money every year to the local 4H shooting sports, area youth hunts and sponsor chilren to the Karl E Kelley Youth Camp near West Laffayete IN. It is our belief that passing our experience to the youth in the area we pass along the founding fathers vision of our country and our club. Our club consists of around 225 members. We meet on the third Monday of month Aug-Nov and Jan-May. The location varies each month. Please see our Meeting Locations icon on the side for details. To join our club come to one of our meeting. Wes Settle severed as the “The Sportsmen Against Poaching” 1st President starting in July 1975. He served 5 years (1975-1979) as president. The other elected officers included Vice President Arnold Stratman, Secretary Mike Woolsey, and Treasurer Anthony A. Krapf. The club started with a mission of hunters and farmers against poaching. Wes was very instrumental in organizing the group of charter members drafting By-Laws for the club. The club became incorporated on December 23, 1977 with a filling fee of $10 dollars. During the five years the dues were $3 and the annual budget was around $1000 dollars. The club started “Airplane Night Patrols” with the Indiana Conservation Officers. This program coordinated ground and air support looking for poachers. Robert Verkamp served as our 2nd President starting in July 1980. He served 6 years (1980-1985). The club became known as the “Dubois County Sportsmen Against Poaching. Officers serving with Robert included Vice President Albert Verkamp, Secretary Pat Tretter, and Treasurer James Luegers. In 1981 the club built 200 “Woodduck boxes”. The chairmen overseeing the project were Norm Fromme and Jim Luegers. Club members and the Indiana Conservation Officers (Tom Jahn, Steve Woolwine, and Anthony Sanders) hung the boxes on trees along many rivers, lakes and ponds in Dubois County. The first “Big Buck Award” was started in 1981. The club continued the “Airplane Night Patrols”. The club decided to recognize member legally harvested trophies by scoring the previous season deer harvest. The annual dues were still kept at $3 per year. Stan Wehr served as the club’s 3rd President starting in July 1986. He served for two years between 1986 and 1987. Also serving were Vice President Bob Hertz, Secretary Bob Scherele, and Treasurer Allen Voges. Ray Howard served as the club’s 4th President starting in July 1988. He served 6 years between the years 1988-1993. Albert Astrike served as Treasurer during Ray’s presidency. In 1989, Ray started the current January Gun Raffle as a fundraiser. The idea came from a firehouse raffle in Pennsylvania. It was presented to the board as a fundraiser for the club. The successful fundraiser continues today as one of the club’s top event. The club participated in the monthly Newsletter “Protect What’s Right” for Club Associates. The National Newsletter based out of Columbus, Ohio focused on hunting and conservation issues under the Wildlife Legislative Fund of America. Their mission was to protect the Heritage of the American Sportsman to hunt, fish and to trap. In 1990 the club’s two previous past presidents Wes Settle and Robert Verkamp were feathered in a two page spread in the GAD-A-BOUT. This was the first issue of the statewide newspaper focusing on conservation and the outdoors. The editor was Ray Dickerson. The club participated in a 1992 “Challenge Cost Share Agreement” with the United States Department of Agriculture Forest Service. The club provided needed labor and seed on habitat maintenance and management in the Hoosier National Forest for the $3000 dollar project. President Howard signed a contract with USDA District Ranger James E. Denoncour. Dan Fuhs was elected the club’s 5th President in July of 1994. Dan served 4 years (1994-1997) as president. Officers serving with Fuhs were Treasurer Mark Vaal. Dan served on the Indiana T.I.P. Board of Directors. He represented the club at quarterly T.I.P. meetings in Indianapolis. The club not only a hunting and fishing club, but focusing on conservation reintroduced river otters by working and providing appropriate funds with the DNR and Indiana Veterinarian Association. Two river otters native to Indiana were released by the DNR at an undisclosed location in the Patoka River. The male and female flourished in the river. The club participated in “Land Night Patrols” with the DNR. The club assisted Scotty Wilson with the first DNR canine unit in Southern Indiana. The club also provided funds helping the training of the dog and owner Scotty Wilson at a Florida kennel. Later the training Wilson received was passed on to other canine units in Indiana. Bret Collignon served as the club’s 6th President between July 1998 and 1999. He served a two year term. Other officers included Vice President Kevin Sheperd, Treasurer Mark Vaal, and Secretary Brandon Brosmer. During his term the club started sending up to 3 kids plus one from Big Brothers/Big Sisters organization to the second annual ICO camp (1998) in Lafayette, Indiana. Collignon was instrumental in petitioning the United States Department of Agriculture to continue controlled burns in wildlife areas to stimulate new growth vegetation on private and state property. Tony Burton was elected as the 7th Dubois County Sportsmen’s Club President. Burton served 4 years between July 2000 and 2003. Steve Luegers served as Vice President. Tony started a Kids Free Fishing Derby with Paul Klem and Terry Rottet at Patoka Lake. Tony worked hard with landowners in Dubois County assisting with the seeding of wildlife food plots. Conrad Blessinger was elected the 8th President in July 2004. He served two years of 2004 and 2005. Kennth Rasche served as Vice President and Kevin Mehringer served as Treasurer. 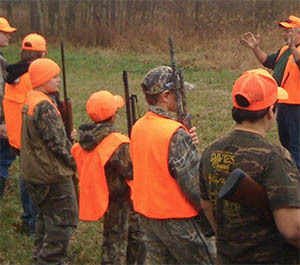 Blessinger worked with Glendale Fish and Wildlife Area in Daviess County 1st Annual Youth Pheasant Hunt in 2004. The club started our own version of the “Hunt for the Hungry Program” under Vice President Kennth Rasche, Paul Gogel (Ferdinand Processing) and Chairman Gene Kuntz midseason in 2005. A total of six deer were donated to the program. Kenneth Rasche was elected as our 9th President in July 2006. He served the two years of 2006 and 2007. Steve Blessinger served as Vice President along with Mark Vaal as Secretary and Kevin Mehringer as Treasurer. Rasche was instrumental in obtaining the club’s 501C3 charity gaming license. He also obtained the club’s “Tax Free Status”. During Kenny’s term dues went to $10.00 per year or $25.00 per 3 years. Rasche along with Hunt for the Hungry Chairman Gene Kuntz grew the program 72 deer in two years. Rasche changed the spring banquet to a “Fall Wildgame Smoker” in October. The second Smoker had Preston Crabtree from Hunter’s Specialties as a major speaker. Club members started paying $2 per meal in 2006. John E.Toy was elected as our 10th President in July 2008. He is currently serving his 7th year (2008-2015). Sid Fritch served as Vice President along with Shawn Werner as secretary and Kevin Mehringer as Treasurer. He started the 10-step agenda for meetings and reintroduced the committee format to the club. President Toy appointed chairman for all 15 committees. He delegated many duties to the committee chairmen streamlining the club’s activities. Toy started the “LIFETIME ACHEIVEMENT AWARD” an award for special lifetime commitment to the conservation of wildlife in the state of Indiana. The club gave two awards during his presidency. The first award went to First Sargent of District 7 Tom Jahn at the October 20, 2010 Smoker upon his retirement. The second award went to retired Indiana/Dubois County Conservation Officer Ron Miller on May 5, 2013 for his 28 years of service to the State of Indiana. Toy along with the help of Chairman Paul Klem restarted the Kids Fishing Derby in 2011. In memory of Chairman Paul Klem the fishing derby’s name was change to honor the late club member after his death in 2013. Dave Kreilein was appointed the new chairman in 2014 of the free “Paul Klem Annual Fishing Derby”. President Toy along with Hunt for the Hungry Chairman Gene Kuntz grew the program to 126 deer in 2009 and a total of 752 legally harvested deer in 10 year of 2014 season. In 2013 the Hunt for the Hungry Program expanded into surrounding counties including (Martin, Daviess, Orange, and Spencer). John brought in world renown speakers for spring turkey events including Preston Pittman (April 2010) from Mississippi, Eddie Salter (March 2011) from Alabama, and Harold Knight (February 20, 2015) from Cadiz, Kentucky. The club continues to sponsor the Youth Pheasant Hunt at Glendale for its 12th year in 2015. In the year 2013 meals went up to $3 US dollars.